Former Massachusetts Gov. William Weld (R) is the first to announce he’s running against Donald Trump for the Republican Presidential nomination…. 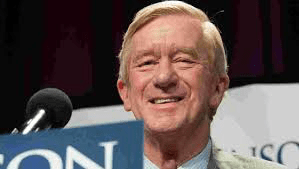 Weld will get some media coverage…. But ya NEVER know what could happen in the future, eh? The Republican National Committee has taken steps to head off a potential primary challenger, voting to express its “undivided support” for the president. And the Trump campaign has been staffing up with party insiders to map out a delegates strategy to ensure there are no surprises at the 2020 convention….